Personally, I am glad Raven blocked her and hopefully will take a high road. Who knows with her. Bekkah —-imo ugh, so not a class act. Butts into anything she can to keep current, if I’m being kind, otherwise she is simply stupid without filters. Tia—I received wonderful, kind, caring things about her personally from some one who personally knows her the season she was on and I tend to believe it. So I wish her the best. Why is Raven even involved here? This seems to be about Bekkah and Tia. If anyone is butting in, I think it's Raven. @pavalygurl she probably most, definitely is. I think she was in “Paradise” and thus a close player. Raven is, from what I gather like an older sister to Tia, whether Tia wants that or not. My stance is it’s better to disengage than to engage. Raven is IMO OTT and outspoken, Adam seems to have a good mellowing influence on her. Bekkah is just IMO— puts her finger into every pie in the name of friendship whether asked or not, and literally doesn’t think about what comes out of her mouth. Well, I just remember that it was Raven and Adam that spilled some of this info about Tia being in contact with one of Becca's guys in January on a podcast in March that was later revealed to be Colton. 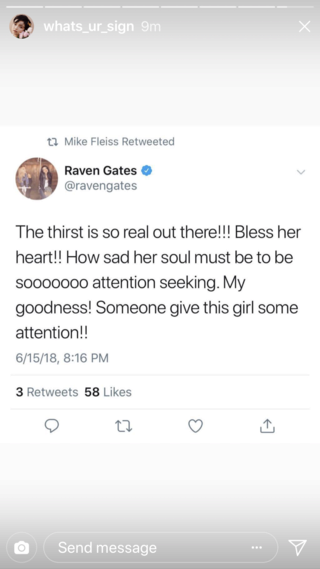 Raven has not done her "friend" Tia any favors in this situation from the beginning. I don’t think much of Raven. She may have been dropped on her head as a baby, just saying. Ehh I don't think any of these parties is innocent. Baby Bekah extending her 15 minutes, Raven seems overly involved when in reality she has no part in it, and the whole 'I'm completely over Colton but I'm going to show up at the end of the season and take him back' move Tia pulled. Have these ladies ever heard of texting? A phone call? Snail mail? Colton, IMO, represents an obstacle that Becca needs to work through. Arie’s storyline was all about being with Becca while also being emotionally tied to another woman. Some women allow that to taint their future by transferring the hurt, embarrassment, and/or doubt of being with an emotional cheater into their future relationships. A kind of transference. I do think keeping Colton, who may or may not harbor feelings for Tia, is a strange but good way for Becca to rid herself of the residue Arie may have caused. She has other men who she is also attracted to so the Colton situation has less power. I see him as being more symbolic than anything else... representing a barrier Becca may have entered filming with and that she is intentially facing by getting to know Colton. All that squabbling on Twitter just makes both Raven and Bekkah look bad, imo. I don’t mind Colton although not for Becca. I know he and Tia went on a date while on BIP but wonder if it went beyond that?